Author’s Note: Just to give some context; I’m a mission worker with Eastern Mennonite Missions in La Ceiba, Honduras. I in conjunction with the local Mennonite congregation, work in Los Laureles, a community built in and around the municipal garbage dump. If you’d like to read or see more about our work there you can visit my blog here. So here’s an example of injustice, greed, political corruption and a general screwing of the poor and powerless and it just fills me with raw anger. Stay with me here because some of this gets tedious but I think it’s necessary for understanding the problem we’re facing. Very often I get asked about how the people here in the garbage dump survive, what do they do for a living? Here’s the long version. Many men work as day laborers in construction, a few as night watchmen and quite a large number buy green bananas that come in from the plantations of Tocoa and then sell them throughout the La Ceiba area on the back of rusting-out pickup trucks. However, the largest form of income by far here in the community is connected in some way or other to the garbage collection process. No one scavenges directly off the dump anymore, those days ended almost 10 years ago when the city privatized the dump had it covered over, converted into a landfill and barred the residents from intruding onto the new dumping area. The garbage though has continued to be a major and vital part of the economy here in the community, much to the chagrin of both the mayor’s office and the private waste treatment company (I’ll explain why in a bit). The company itself is not responsible for the collection of the garbage, they simply control what passes through their gates at the far end of the community and are then responsible for the treatment of the waste that is constantly being interred. The collection then, falls to the mayor and his cronies in the form of contracts; the mayor awards collection contracts to the people he owes political favors and those people in turn use a portion of that money to buy “garbage trucks” (converted, massive and pitifully old delivery trucks), hire truck drivers and a few assistants who actually collect the garbage. The drivers and assistants, usually 2-3 per truck, are also joined by scavengers who make a living by sorting through the garbage as it travels en route to the dump. They look for plastic bottles, metal scraps, car batteries and anything else that might be of worth (I’m talking everything from bed frames to clothing to half-used perfume bottles), sort it into separate bags and then upon arrival to the community and just before the truck passes through the gates into the no-entry zone of the new landfill, the scavengers disembark and sell their findings to a group of families who have made their living buying these items, sorting them, weighing them and then re-selling them to the local recycling company or interested parties, whichever the case may be. These people are perhaps the most resilient and hard-scrabble of the whole collection lot for they live and die by what the trucks bring in and what price the recyclers set; they work long hours, Monday through Saturday in the baking sun and torrential rain bent over and sifting through plastics for next to nothing in terms of compensation. In fact most of the workers at the collection and weighing site make no money at all, this is their “family farm”, it’s how the family survives, so what little money comes in is given directly to mother and father. Yesterday I was at the dentist‘s and they gave me a toothbrush. Now I hear in the States that‘s not an usual thing, but in Germany it‘s actually really strange and so after the dentist thought she had put her fingers in my mouth long enough and I was allowed to go, I was carrying a toothbrush in the pocket of my jeans and somehow the toothbrush kept coming up in my mind and with it the chorus of a song. A song my father always sang with us when I was a little boy. It‘s about Martin Luther King Jr. and what he said to kids who also wanted to participate in the demonstrations. He told them they could participate, if they had a toothbrush with them. Because if you get arrested you have to empty your pockets and all is taken away from you. Only your toothbrush you can keep. 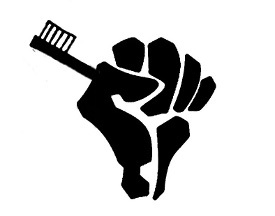 So keep your toothbrush as a sign of your willingness to go to jail for freedom. The song was written in Eastern Germany and was a famous song amongst Christian youth in the protest movement against the state-socialist regime. I was really amazed by this, on the one hand because I rarely remember anything from my childhood, but on the other hand because of the radical message this song was giving. To me, taking up my cross or carrying my toothbrush around is a daily struggle because although it feels good to be really critical of the state and school and be the radical guy in school who challenges basically every opinion, my radical activity is usually done there (sometimes I also translate stuff for the German CPT branch…). How can I live a life where it makes sense to carry my toothbrush with me all the time, because I challenge the world so much, that it can’t stand me, it wants to put me in prison? I sometimes lead Sunday school classes in my congregation at home, and I’d love to sing that song with the kids, but I feel like I have to carry my toothbrush with me for some time, till I can do that. For the last few months I haven’t been as active on Young Anabaptist Radicals as usual. Aside from my normal work doing web design and work for Christian Peacemaker Teams, I took a class on Anabaptist History and Theology. I’ve also been part of organizing a gathering in conjunction with the US Social Forum in Detroit. It’s called Becoming Undone: a gathering of Christians drawn to Anabaptism and the continuing work of Undoing Opressions. Follow the link for more details. There’s still room if you register now! I’ve also been very involved in a movement called Spark Renewal. To be honest, in reading this article, there’s not a whole lot that needs to be added. I think the framers of the confession did a remarkable job of wrapping up a lot in a very short piece. However, what I would like to comment on is something that seems to have received lesser emphasis in our current culture. This article talks a lot about Jesus’ acts and what he did and achieved as a human among us. It deliberately talks about him as someone other than God the Father. He’s a prophet, a high priest, a king, a servant, a Savior, the Son of God, the incarnate Word, the Lord and final judge. But there is something that gets passing mention that I think is important to re-emphasize. See, in today’s pluralistic society, people like Jesus are a dime a dozen. There are so many religious figures that people can point to as a “good person” or a “prophet like no others” or an “inspiring figure”. People can be disciples of almost anyone, any great teacher. What sets Jesus apart from all the others? As fully divine, he is the one in whom the fullness of God was pleased to dwell. During his earthly life, Jesus had an intimate relationship with his heavenly Abba and taught his disciples to pray “Abba, Father.” He is the image of the invisible God, and “all things have been created through him and for him, for he is before all things.